Pickleball is a type of game that people of all ages can enjoy it, there is no age bar for this game. The rules to play this game are really simple and easily understandable. You just need to have a good ball for playing and a nice paddle that suits you. You will find a lot of different types of paddles in the market and you might get confused about which one will be the best. 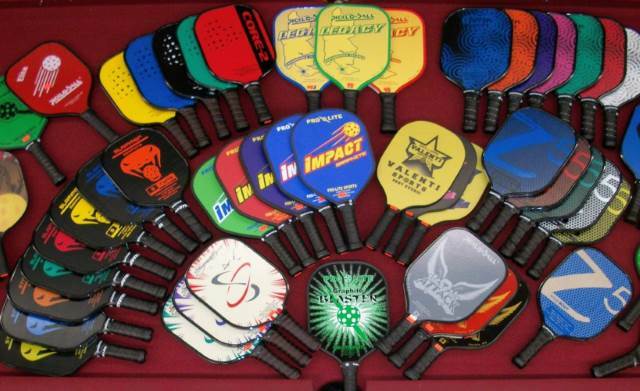 But at Wolfe Sports, you will be provided the best paddle that will suit you. The most important factors in any game are to practice, to hone your skills and to learn some useful tricks while playing. When we talk of pickleball, having the paddle will do the trick because in this sport the paddle is the most important thing. While choosing the right paddle the most important thing is the structure of the paddle. The paddles are available in different materials and the surface of the paddle is made from any of the following materials- wood, graphite, which is also called carbon fiber. Choosing the right grip is one of the most significant parts while selecting the right paddle. When you have the right grip, you will be able to play like a pro. But if you have a large grip that is even larger for you hand, half of the time you will waste on adjusting the paddle properly. And if the grip is very small then you will not be able to have a control on the paddle while playing. Players who have height more than 5’8” should prefer the grip of 41/2” size. Players who have a mid height range should select 41/4” grip size. Players who have small height like 5’ or the players are children should prefer the grip size of 4” to 4 1/8”. If still you can’t understand what grip size you want then you can always go through the trial and error method. This way you can get to know which size will be perfect for your hand. The rules about the length of the paddle state that it should not be more than 24” so in order to follow this you can select the paddle with longer handle and a relatively smaller hitting surface. But this choice solely depends on your comfort. So you can select the paddle according to what you can play best with. When you have short handled paddles, the chances of error increases while aiming but as long as you have long handled paddles, you can swing the paddles freely and thus reduce the chances of error. Also the longer handles are also comfortable with people with large hands. If an experienced player who wants to stay on the top in every game, you ought to have the Nomex core that is covered in carbon fiber. This is what you need to have because you actually deserve it. The people who are not much experienced should go with the composite type of paddles these paddles are cost effective and lightweight. If you can control the wooden paddles and have that much stamina to play with them then you should surely go with these because they are the cheapest paddles in the market. If you have tried out the composite ones and still you cannot find them to be useful then you should try some other types but if you have not yet tried out the composite ones then you really need to try out these paddles because these are on the best options for you if you are not a professional and still need a lot of practice.